Every year brings us highs and lows locally, nationally and on the world stage, and 2016 was one of the most momentous in living memory. The Christmas Day death of singer George Michael was the latest in a long line of tragedies to hit the entertainment industry, while the unexpected Brexit vote and election of Donald Trump as the President of the US has created a time of political uncertainty. One thing that is certain, however, is that Falkirk Bairns and those from across the district continue to make a difference year in, year out. In no particular order of importance we look back at the top ten who have achieved great things in 2016. 1 By far the event that affects most of us was the referendum on Britain’s membership of the European Union (EU) and Falkirk Council chief executive Mary Pitcaithly was the one to announce the result in Scotland. At around 4.50am on Friday, June 24, at Grangemouth Sports Complex, Mrs Pitcaithly told the world that Scotland had voted to remain in the EU with 1,661,191 votes to 1,018,322 who wanted to leave. Falkirk had also voted to stay in with 44,987 votes compared to 34,271 in the leave camp. 2 Three men hit the headlines in the Herald in June when they rescued another man from certain death after he had fallen in the Forth & Clyde Canal at Lock 16 in Camelon. Andrew Young (29), from Westquarter, Tony McGoldrick (55), from Bainsford, and Robert Dale (60), from New Carron, worked together to keep the man’s head above water until emergency services arrived and pulled him to safety. Inspector Anton Stephenson of Falkirk Police Station said the heroes’ “brave” actions “undoubtedly” saved the man’s life. 3 Rory Wilson, a 20-year-old from Carronshore, was recently chosen for the Team GB basketball squad for the World Transplant Games in Malaga where his 6ft 11in frame will come in handy for scoring a few baskets. Rory has had two liver transplants and being chosen for the British side is the icing on the cake for his determined recovery. 4 The Falkirk Foodbank is a place where humanity breeds on an unprecedented level as volunteers busy themselves sorting through the tons of donations given by Bairns from all over the district. Manager Jim Couper says the Falkirk people are the most generous in the country and help the centre feed hundreds of families and individuals who have fallen on hard times. Kind-hearted nine-year-old Callum Smith from Larbert showed us all the true spirit of Christmas last week when he told his mum Lynnsay he wanted his presents to go to children less fortunate than himself. Lynnsay then arranged for him to do a shift at the foodbank so he could do his bit. He is a true inspiration to others. 5NHS Forth Valley’s Nurses Choir raise money and hope for patients, families and the Falkirk community but it was their turn to be on the receiving end of a good deed when they were chosen as the unexpected guests of comedian Michael McIntyre’s Christmas Eve TV show. They had travelled to London thinking they were auditioning for a show, but instead found themselves on stage in front of a 2200-strong audience after being set up by their colleagues. 6 Sports enthusiast Andrew Lauder (20) from Larbert landed the sportScotland Volunteer of the Year title back in November for his dedication to the Tryst Community Sports Club where, over the last five years, the student has been crucial to the club’s success. Andrew helps give young people a voice in how the community sports hub is run and does a multitude of work including updating social media and visiting school fayres to promote the club and taking classes. 7CVS Falkirk is the district’s umbrella organisation bringing together a plethora of voluntary groups which provide services in communities. Their annual awards ceremony is always a keenly awaited event in the social calendar and this year’s Volunteer of the Year was Nathan Sinclair of Re-Union Canal Boats for the support he has offered to his fellow volunteers and the charity. 8At the same awards, the selfless work of a very special lady was also recognised when Margaret Paton received the Falkirk Provost’s Lifetime Achievement Award and a Long Service Award for 43 years’ dedication to the Laurieston community. 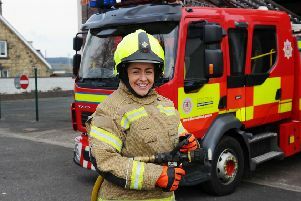 9Jill Lauder from Grangemouth is another local woman who dedicates time to others. Hairdresser Jill, who owns Lady J’s Unisex Salon, lost three close friends to cancer and became the inspiration for her Feel Good Project which enables her and her trusty band of volunteers to pamper women suffering from the illness once a month providing wigs, haircuts and advice. 10Boxer Stevie ‘The Buzzsaw’ Beattie from Slamannan arrived on the professional scene with his first win as a professional in February with a points decision victory over Kris Laight at Bellahouston in Glasgow. He has since fought another four times, remains unbeaten as a professional and is tipped for a bright future in the ring.